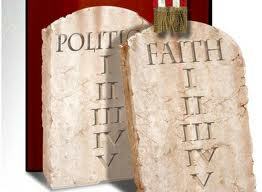 To what extent should Christian ministers engage in politics? As Christian ministers and leaders become more politically active, this is a question that must be considered. Whether we like it, or rather acknowledge it or not, ministers have spiritual power to speak into the systems of this world, and prophetically call forth the things that are not, while at the same time nullifying the things that are that do not reflect the glory of God. How we use this power can both influence people for good or for evil, and so we must be mindful of how we use it. In his article, Applying Volf, Greg Metzger speaks to this truth as well. For him, as well as Volf for that matter, persons who exercise dual roles in both the ecclesial and civic life are more exposed to the power of systems – they are vulnerable to manipulation by religious or political organizations because of the power those organizations perceive dual leaders having. As Metzger states, such can have positive affects, however, the reverse can be true when dual leaders are forced to speak for the organizations that they represent instead of the God that they serve. Unfortunately, I see a lot of this happening in our culture today. Ministers and church leaders have greatly compromised their testimony, their prophetic voice by playing to the systems of power that are at work in the world. Even more unfortunate, they persuade their audiences, congregations, and other followers so that they begin to believe that the words from the minister’s mouth are God’s words, God’s ideals, God’s truth when in fact they are nothing more than partisan politics wrapped in Christianese. I believe that we as ministers can get beyond this juncture, but we have to be willing to lay down our own political agenda. We may have to even lay down the political party that we tend to associate the most with. As we do, let us take up the Word of God, and allow the Word to speak to the things that God has been waiting for us so long to challenge. It might not be easy, especially since we tend to define ourselves so much by our political identity. Yet herein lies the problem, our identity should be in Christ and in nothing else. When our identity is found in him, the prophetic voice that God has given us truly comes forth and the political systems that once ensnared us begin to break under the power of His name. If you haven’t purchased your copy of Dancing on Hot Coals, make sure you do so before Christmas. Remember the Kindle edition is only $2.99! IMO, I don’t like the idea. Thank you for your comments, I guess I would be interested to know what you disagree about or what is not resonating with you? Hi, Ebony! Sorry for not being clear with my comment above. I disagree with ministers moving to politics. Just as Metzger said, they are very vulnerable, to a lot of other things. Politics is sort of tainted, and it’s a part of the patterns of this world and it’s sort of not like what the Gospel said about being humble. And politicians these days are far from being that.